Wow. 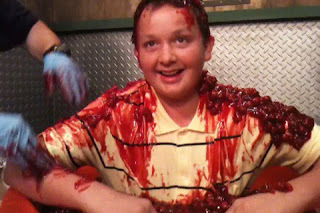 I swear, I feel like taking all the FANS of iCarly and Victorious out to an awesome dinner tonight! Why? To say a huge THANK YOU for the support you guys have been giving our shows. This past Friday night, we aired two new episodes: a one-hour special iCarly called iPsycho, and a Victorious episode called Robarazzi. We got the ratings yesterday, and they were huge. Actually, on Friday night we had a feeling the ratings were going to be high, because of Twitter. 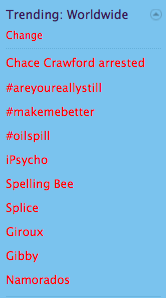 While we were all working that night, filming a new episode of iCarly, I noticed that the title iPsycho was trending on Twitter, worldwide. We were all excited about that. 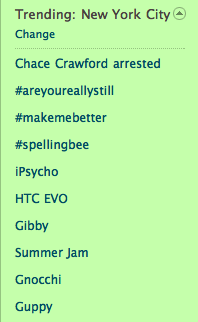 And then, about a half-hour later, we saw that the name Gibby was also trending on Twitter, worldwide! And right after iPsycho aired, the attention on Twitter turned to the Victorious episode, Robarazzi. Tons of buzz and awesome feedback from the fans. Friday night's performance of iCarly's iPsycho drew enormous viewership. The one-hour movie delivered 7.52 million total viewers, making it the most watched entertainment play on cable this quarter, basically matching this year's Kids Choice Awards. Across most kid and teen demos, the performance of iPsycho was the highest rated telecast of the year of any telecast (broadcast or cable), with the exception of iCarly's iSaved Your Life and the Super Bowl. iPsycho's ratings were nearly FOUR TIMES HIGHER than Nickelodeon's direct competition. The Victorious episode Roberazzi – which followed iPsycho – produced stellar ratings, averaging nearly 6 million viewers, the most ever for Victorious, beating the 5.7 million average for the show's premiere. What makes this even more impressive is that Victorious competed head-to-head against a NEW episode of the competition's most popular show. And Victorious got ratings that were more than double the competitions's ratings, with both kids and teens. 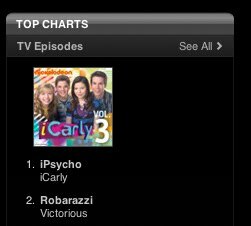 In the Kids section of iTunes television, iPsycho and Robarazzi hold the Top 2 spots! And in music news on iTunes, the Victorious THEME SONG just reached the 100,000 mark in downloads! (If you don't yet have the full version of the theme song, you should get it – it's really great! You can download it by CLICKING HERE. Finally, if you're up for one more piece of fun news that happened this week, iCarly was nominated by the Television Critics of America for a TCA Award for Outstanding Achievement In Youth Programming. So, once again, a massive THANK YOU to the wonderful FANS of iCarly and Victorious for giving the Schneider's Bakery team such overwhelming support. We love making these TV shows for you, and your enthusiasm makes us work even harder to bring you the best, funniest entertainment we can. P.S. Here are some fun links if you're interested in doing some downloading! You can dowload the iCarly one-hour special iPsycho by CLICKING HERE. You can download the Victorious episode Robarazzi by CLICKING HERE. You can download the full Victorious THEME SONG by CLICKING HERE. You can download Miranda's single "Kissin U" by CLICKING HERE. You can download Jennette McCurdy's new single "Not That Far Away" by CLICKING HERE. If you'd like to see Victoria Justice eat her very first sardine, CLICK HERE.